Advocacy groups’ efforts to monitor the Trump administration’s subtle changes to agency websites expanded this week with a lawsuit demanding Health and Human Services Department documents on the decision to remove online materials on women’s health issues and with the unveiling of a new central portal for tracking website changes governmentwide. On March 8, the nonprofit Sunlight Foundation and American Oversight jointly filed suit in U.S. District Court for the District of Columbia to compel HHS to release records on how its Office of Women’s Health quietly removed or obscured fact sheets on such issues as lesbian and bisexual health and low-cost screenings for breast cancer. “The public has a right to know the motive behind the puzzling, and perhaps troubling, decision to delete public health information,” American Oversight Executive Director Austin Evers said. “Both removals of public information happened without advanced notice or explanation from the office, which makes it unclear whether the information was removed by mistake; the removed information was actually inaccurate or outdated; or there was a quiet change in underlying policy, unrelated to the accuracy of the information, that motivated the removal but which was not communicated transparently to the public,” said Rachel Bergman, director of the Sunlight Foundation’s Web Integrity Project. HHS has also been accused of removing or downplaying materials on Affordable Care Act minority outreach efforts. It has responded to the Web Integrity Project’s criticisms by saying that it conducts “standard website management practice” by reviewing, updating and reorganizing content. The agency does not acknowledge policy changes as a motivator. The lawsuit follows up on unsuccessful Freedom of Information Act requests the groups filed in early 2018. It seeks injunctive relief to require delivery of documents related to HHS’s communications with the public affairs firm Hager Sharp, which runs the website for the Office of Women’s Health, as well as other communications involving website user messages to the women’s health website and the agency’s handling of the site. In a related development, the Web Integrity Project on Tuesday unveiled a new “Censorship Tracker.” Called Gov404—a reference to the webpage error message a user encounters after typing in an Internet address for a page no longer available—the online portal assembles in one place the significant website changes made in a variety of agencies. Since last year, the project has monitored agency websites and used the Internet Archive’s “Wayback Machine” to research materials that are no longer posted. In only one out of 50 cases documented in the tracker did the agency alert the public of coming website changes more than a day in advance. 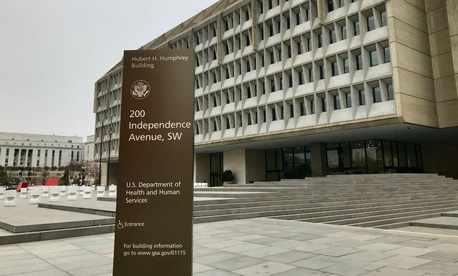 That case was HHS’s removal of its National Guideline Clearinghouse from its Healthcare Research and Quality website, researchers found. In three other cases involving the EPA’s climate change, Clean Water Plan and Clean Water rule, a notice was posted the same day the materials were removed, which, the analysts said, does not fulfill the spirt of the Paperwork Reduction Act.